After breakfast pick up from your hotel and drive to Lake Manyara National Park for afternoon game drive. The park is a thin green band of forest flanked on one side by the sheer 600metres high red and brown cliffs of the escarpment and on the other by the white-hot shores of an ancient soda lake. Dinner and overnight at the camp. After breakfast Proceed for morning game drive where a good network of tracks and roads in the park allows excellent viewing opportunities. Animals seen include buffalo and elephants. Other animals present that can be seen are the tree climbing Lions, Girrafe, Hippo. Thousands of flamingos, Red-billed quelea, Pelicans are few of the many bird species can be seen here. 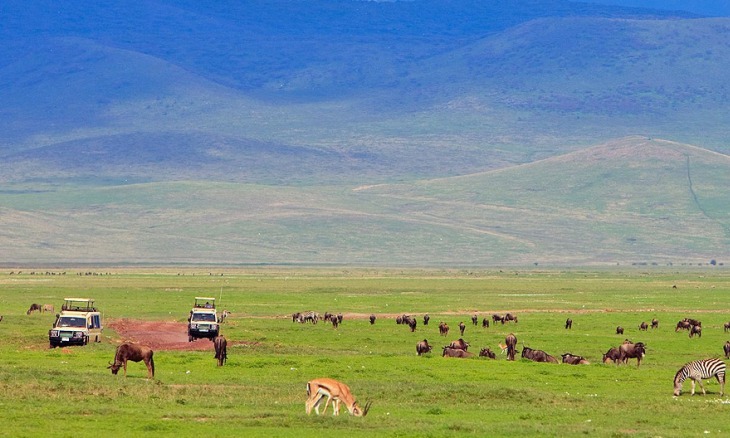 Afternoon drive to Ngorongoro for dinner and overnight at Ngorongoro camp.